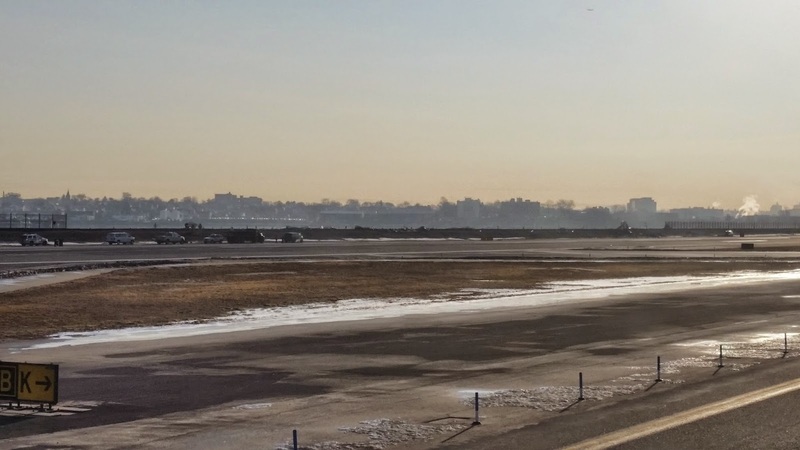 Not happy with the media coverage of Delta Flight 1086 and being a seriously dedicated blogger, I decided to travel to LaGuardia to check out the situation myself. Actually, my trip just happened to take me through LGA last week, and I was able to see exactly where DL 1086 went off the runway and almost into Flushing Bay. What surprised me was that nearly 1000 feet of the fence which was atop the berm that separates the airfield from the bay had been knocked down. News coverage photographs gave the appearance of only a small section of fence that had been knocked down by the nose of the aircraft. What was not apparent was the nearly 1000 feet of fence that had been knocked over by the MD-88s left wing. NTSB reports indicate that the aircraft had a normal approach and landing at 133 knots, but that the aircraft started to drift left upon touchdown. The missing fence was between the 3000 and 2000 foot distance remaining markers. Distance remaining markers are large signs along the runway indicating how many thousands of feet are remaining to the end. A buddy showed me a photo taken in the hangar of the left wing of the MD-88 which was badly damaged by the fence. There were also some reports of leaking fuel which luckily did not ignite.